A sharer may not know the adresses of the recipients’ cozy instances, but he/she has a way to send them an URL on his/her cozy to start the process. A user can preview a sharing before accepting it if the application supports this option. Else, he/she will have only the description and rules to make his/her mind about accepting or refusing the sharing. The data is duplicated: it is both on the owner’s cozy, and on the recipients’ cozy (no cloud federation like NextCloud). The applications say what is shared, the stack synchronizes that. The stack does the low-level stuff and gives primitives to the applications. The applications must use them in a responsible manner, and in particular, to avoid transitivity issues. The CouchDB replication will be used to synchronize the documents. It means that the documents will be same on the owner and on the recipients (“symetric sharing”). For files and folders, the replicator will be customized to handle the specificities of the io.cozy.files doctype. The applications must be able to work with broken relationships between documents. The applications should know how to deal with CouchDB conflicts. At least, the default choice of a winner for conflicts by CouchDB should be acceptable if the applications don’t do anything to detect and resolve conflicts. First safety principle: when a user B accepts a sharing from user A, the documents that were on the user B’s cozy before the sharing are not sent to user A without an explicit action of user B (like moving a file to a shared directory). Second safety principle: when two users, A and B, are sharing documents, a change of a document on the user A’s cozy can’t make an exiting document of user B enter in the sharing. One person decides to share something with other people from an application on her cozy. In our example, Alice wants to share a todo list with her friends, Bob and Charlie, and it is done from the Todo application. The application calls the stack with the rules for this sharing and the identifiers of the contacts with whom to share. The stack persists an io.cozy.sharings document and sends an email to the recipients (Bob an Charlie). A recipient, let’s say Bob, receives the email and clicks on the link. His browser shows him the Todo application on Alice’s Cozy so that he can preview the todo list, and a modal asks him if he wants to continue the sharing acceptation workflow. If he does, a form will ask him what is the address of his Cozy (the form can be pre-filled if he has already accepted another sharing in the past). After he has filled the form and submitted it, he is redirected on his Cozy. If he is not logged in, he has to login first. Then, a page describes him how the sharing will work and what technical permissions it implies. It also asks him to confirm the sharing. If he accepts, his instance will send to Alice’s instance the answer. Alice’s Cozy instance creates token and sends them with other informations as the response of the answer request from Bob’s instance. At this moment, both instances are ready to start to replicate data to the other instances. So, let’s do the initial replication. Alice’s instance starts to fill the io.cozy.shared database with all the documents that match a rule of the sharing (except the rules with local: true), and create triggers for the future documents to be also added in this database (the exact triggers depend of the parameters of the rules). And, when done, it creates a job for the replicator, and setups a trigger for future changes in the io.cozy.shared start a replicator job. Bob’s instance also checks if any document matches a sharing rule. In most cases, it won’t. But in some very special cases (e.g. a previous revoked sharing on the same documents), there are some documents that match a rule. They are added to the io.cozy.shared database, but with a conflict flag. They won’t be replicated unless Bob accepts to in his Todo application. Triggers are also added on Bob’s instance for filling the io.cozy.shared database, and to call the replicator after that. Note: there will be a lock around the initial filling of the io.cozy.shared database to avoid concurrency issues if two recipients accept the sharing at the same time. Step 6: the replicator send the changes to Charlie’s Cozy, all the cozy instances are synchronized again! Note: when a todo item is moved fron a shared todo list to a not shared todo list, the document in io.cozy.shared for the todo item is kept, and the sharing id is associated to the keyword removed inside it. The remove behavior of the sharing rule is then applied. Files are special for several reasons. First and foremost, they have a binary attached to them that can be quite heavy. The stack also enforces some rules on them (e.g. a file can’t be added to a deleted folder) and has some specific code for the tree nature of files and folders (e.g. a permission on a folder is inherited on all the files and folders inside it, even if they are several levels below). 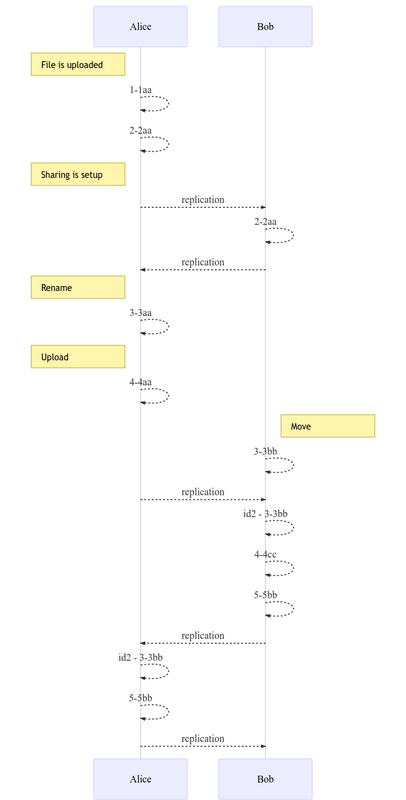 Thus, the workflow explained just before is not compatible with the files. As we need to introduce some code specific to the files, we have also wanted to improve the sharing of files. First, we don’t want to force the recipients to put the shared folder at exactly the same place as the owner. In fact, we think that putting the shared folder in a folder called Shared with me is more friendly. We also think that a file that has been shared in the past but is no longer (the sharing has been revoked) can evolve on both the owner’s cozy and on the recipients’ cozy in different ways, and in such a case, it’s more logical to consider them as different files. These two reasons implies, on a technical level, that the identifiers for files and folders are not the same on the owner and the recipients of a sharing. The replicator will translate the identifiers from one system to another during the replications. Of course, it will also translate the id in the sharing rules, and the dir_id to preserve the relationship between a file and its parent folder. 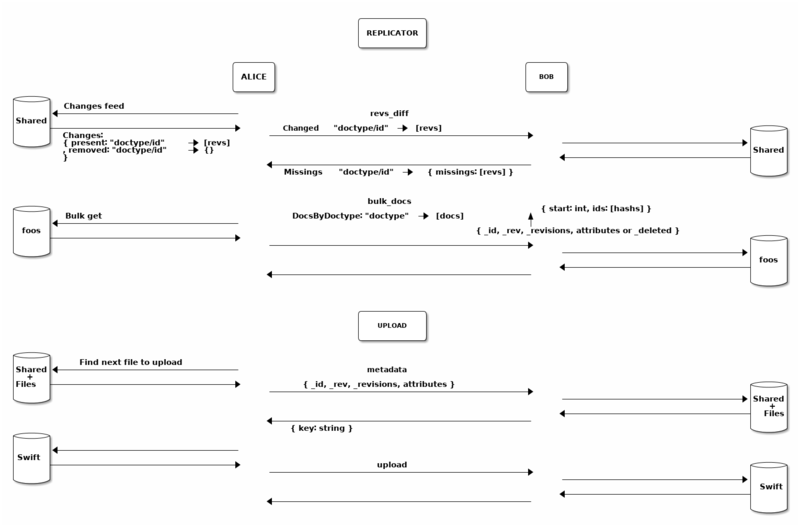 The path attribute will be seen as a cache, and recomputed when a cozy instance receives a folder document from a sharing replication. We will continue to have a replication as close to the CouchDB replication as possible. It means we synchronize a state, and not looking for the history of operations like cozy-desktop does. It is less accurate and can lead more often to conflicts. The cozy instances are expected to be online most of the time and have a short delay for replications: we think that the conflicts will happen only on rares occasions. This make acceptable to take this shortcut. And, in case of conflicts, we will preserve the content of the files (no data loss), even if it means duplicating the files. When a sharing involves a rule on the io.cozy.files doctype, a folder is created on the recipients cozy where the files will be put. It is created inside the Shared with me folder by default, but can be moved somewhere else after that. The folder won’t be synchronized its-self later, and if the folder is trashed, the sharing is automatically revoked. As it is not a reversible action, a confirmation is asked before doing that. Note: we will forbid the sharing of the root of the virtual file system, of the trash and trashed files/folders, and of the Shared with me folder. The step 3 described above, aka the replicator, will be more complicated for folders and files. First change, it will work on two phases: 1. what can be synchronized without transfering the binaries first, and 2. the synchronization of files with a binary attached. Second change, the replicator will acquire the Virtual File System lock on the cozy instance where it will write things to ensure the consistency of what it writes. Third change, before inserting a folder or file in the database, the replicator checks that its parent exists, and if it’s not the case, it creates it. Last change, we will avoid CouchDB conflicts for files and folder by using a special conflict resolution process. When a file or folder is created or updated on cozy instance while the parent directory is trashed concurrently on another cozy instance. For 1. and 2., we will reconciliate the changes except for a file with two versions having a distinct binary (we rely on size and checksum to detect that). In such a case, we create a copy of the file with one version, while keeping the other version in the original file. For 3., we rename the file or folder with the smaller id. For 4., we restore the trashed parent, or recreate it if it the trash was emptied. When a file is modified concurrently on two cozy instances, and at least one change involve the content, we can’t reconciliate the modifications. To know which version of the file is the “winner” and will keep the same identifier, and which version is the “loser” and will have a new identifier, we compare the revisions and the higher wins. This conflict is particulary tricky to resolve, with a lot of subcases. In particular, we try to converge to the same revisions on all the instances for the “winner” file (and for the “loser” too). created_at, updated_at, tags, referenced_by, etc. For the first two sets, the operation on the Virtual File System will needs to reach the storage (Swift), not just CouchDB. For the third set, it’s easy: we can do the change at the same time as another change, because these attributes are only used in CouchDB. But we can’t do a change on the first two sets at the same time: the Virtual File System can’t update the content and move/rename a file in the same operation. If we needs to do both, it will generate 2 revisions in CouchDB for the file. Note: you can see that using CouchDB-like replication protocol means that we have some replications that can look useless, just some echo to a writing. In fact, it is used to acknowledge the writing and is helpful for conflict resolutions. It may be conter-intuitive, but removing them will harm the stability of the system, even if they do nothing most of the time. Here, Alice uploads a file on her Cozy. It creates two revisions for this file (it’s what the Virtual File System does). Then, she shares the directory with this file to her friend Bob. When Bob accepts the sharing, the file is sent to his Cozy, with the same revision (2-2aa). Later, Bob renames the file. It creates a new revision (3-3aa). The change is replicated to Alice’s Cozy. And we have a replication from Alice to Bob to ensure that every thing is fine. Even later, Alice and Bob both renames the file at the same time. It creates a conflict. We have a first replication (from Alice to Bob), but nothing happens on B because the local revision (4-4bb) is greater than the candidate revision (4-4aa) and the content is the same. Just after that, we have a revision on the opposite direction (from Bob to Alice). 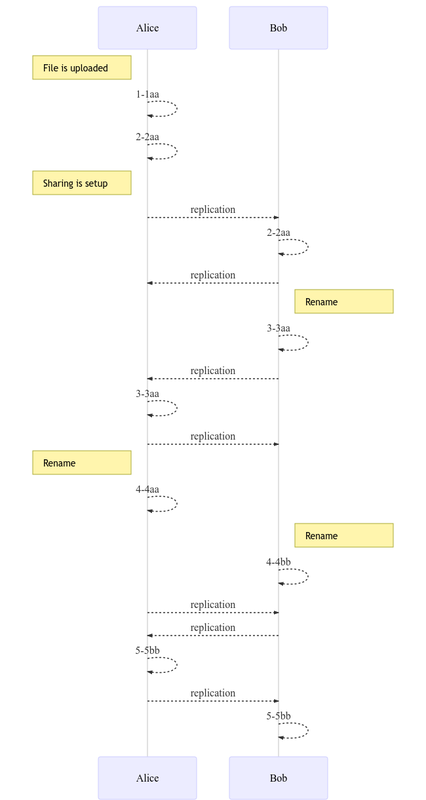 The candidate revision wins (4-4bb), but for files, we don’t use CouchDB conflict, thus it’s not possible to write a new revision at the same generation (4). The only option is to create a new revision (5-5bb). This revision is then sent to Bob: Bob’s Cozy accepts the new revision even if it has no effect on the file (it was already the good name), just to resolve the conflict. Bob moves the file to a sub-directory. A copy of the file is created from the revision 3-3bb, with the new identifier id2 = XorID(id, 3-3bb). The new content is written on Bob’s Cozy: we can’t use the revisions 3-3aa (same generation as 3-3bb) and 4-4aa (it will mean the conflict is fixed, but it’s not the case, the filenames are still different), so a new revision is used (4-4cc). The file is moved and renamed on Bob’s Cozy, with a next revision (5-5bb). The two files are sent to Alice’s Cozy: 5-5bb is accepted just to resolve the conflict, and id2 is uploaded as a new file.